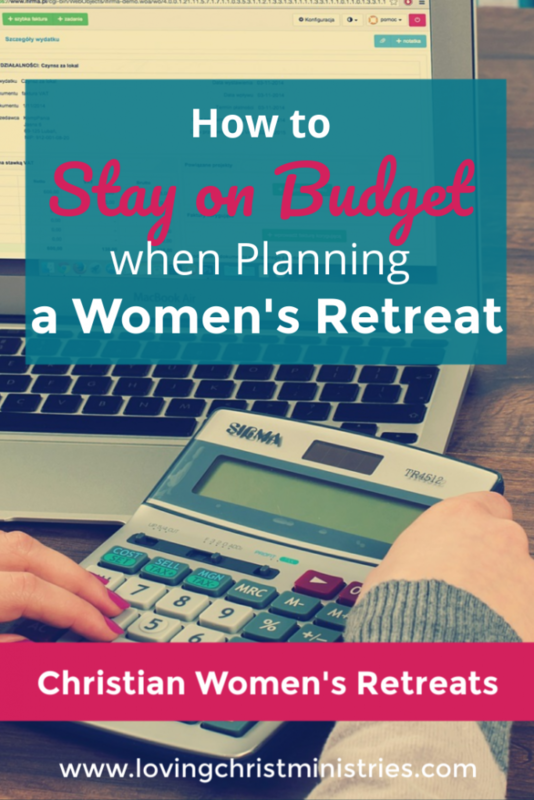 Being able to stay on budget when planning a retreat takes careful planning. There’s a fine line between ‘income’ (pre-existing budget plus donations plus registration fees) and expenses when planning for a retreat, and I’ve learned firsthand how important it is to stay on budget. We’ve lived the panicky moments when we weren’t sure how we were going to pay for insurance or offer the activities we wanted to have. Recently, I shared a post on the blog called Christian Women’s Retreat Fails where I wrote about some of the things I’ve done wrong in my retreat planning and implementation. Number two on that list was not charging enough to cover expenses. What you charge is something to consider carefully, and I will be posting more on that soon. No matter what you end up charging, it’s important to stay on budget. We’ve never had a large budget and tried to remain frugal in all areas. This wasn’t always easy since we really wanted to spoil the ladies with tons of extras. Plus, price often crept up with our overnight retreats as we had to pay for lodging. The good part, however, is the low cost of the campground where we stay. It’s only $20 per night per person. That’s much cheaper than the ladies having to get a hotel room. 1. Create your own registration forms and promotional flyers. If someone on your planning team has the know-how, see if they’ll volunteer to create the promotional items you’ll need. For a low cost option, I have forms I’ve created that you can customize to fit your retreat. Hiring a professional graphic designer will cost big bucks so unless your budget is huge, I’d choose another option. 2. Provide buffet style, home cooking for meals rather than restaurant meals. Many venues provide a cook for events for an additional charge. This would be less expensive than having a restaurant cater or having take-out. For an even more frugal option, have one or more of your ladies volunteer to cook meals in exchange for their retreat cost. We do this, and it works wonderfully well! While it’s lots of fun to hold a retreat at a fancy venue, you can save costs by staying local. Many churches allow their members to use facilities free of charge. Ours does and it also rents the space to non-members for a very low cost. Shop around among the ladies in your group and see if any of them own or know of a facility that would cut you a deal for a church retreat. We were fortunate in that one of our ladies actually owned a campground. While not everyone has that option, there may be possibilities you haven’t thought about. 4. Plan activities that don’t require many supplies and/or request help from sponsors for supplies. Keep activities simple. Easy crafts, nature walks, and sing-a-longs don’t cost much and are meaningful and fun. For the supplies you do need, consider using our free sponsor request letter template to involve local businesses. 5. Adjust the length of your retreat if needed. 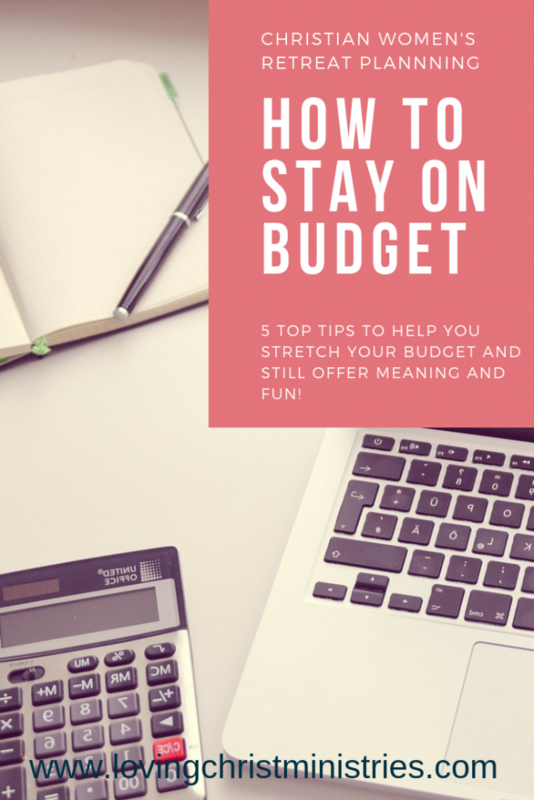 Rather than a full weekend, try just an overnight or a one day retreat to keep costs down if your budget isn’t very big. Hope these ideas help a little as you’re planning your next retreat and need to implement ways to save on costs. Want to remember this? Post this 5 Favorite Verses to Teach Your Preteen Daughter to your favorite Pinterest board!